Where do I begin to thank you for all that you have done for our family? “No words can begin to express our ‘heartfelt thanks’ for your kindness and thoughtfulness during such difficult times. Knowing that you cared so much and wanted to assist our family helped ease the pain and stressors that we had been feeling for so long”. From the first moment on the phone I had a feeling that your working with us was the answer our family needed. We had tried on our own unsuccessfully to convince Paul to seek help, and now we understand why you are successful. We were way too emotionally involved and lacked the knowledge that your professional help brought. We put our hope in you, and it worked I would like to thank you and extend our sincerest appreciation for the time and knowledge you put into helping us get my husband into treatment. I know in my heart we could not have gotten him there without your presence and experience. You are a true blessing and godsend to our family. Our story goes like this, the short version……my husband, my best friend, father & lover had taken to alcohol. Once he came back from Iraq he was not the same. The isolation and drinking consumed him. After a short while sober he “went back out” as AA says and he has been gone ever since….4 years, 8 months to be exact….until now of course. To write about the actual intervention is tough ….. I just know that the letters that were prepared by our family had a very powerful effect on Paul but not enough for him to accept our gift right away…. we actually had to read our “bottom line” (which from what I understand few interventions get that far).…had we not had you involved our children would have not been able to convince him to go to rehab and accept our gift. The outcome…..today Paul has 50 days sober….one day at a time. I thank you again from the bottom of my heart. May God Bless you all for the work that you do in conquering addictions! As you know, our lives took an unexpected traumatic turn over the course of the last year. We were losing our daughter, but we were not positive who the enemy was. We had days and nights waiting for her to come home. When she did the lies were apparent to us, but we wanted to believe her. The last six months brought court dates, speeding tickets, car accidents, car impounds and jail time. The worst part however, is when all of our fears were confirmed she was using drugs and heroin was now part of our lives. We struggled over and over again about what to do where to turn for the right help. We had no direction no tools at our disposal to help our daughter. We were so fortunate to have received the name and phone number of your organization. That first phone call put us on the right track to getting what we needed to really help our daughter. You’re support and direction was awesome. You made us feel that you really understood our situation. You did not judge us but were extremely compassionate and made yourselves available to us any time day or night. We truly are appreciative of all the support and help that you have given us. We cannot even imagine were our daughter would be today without your help. City of Angels is a wonderful organization that helps those suffering from addiction. The entire organization is made up of volunteers desperately trying to save our children against a disease that has no boundaries. They have been a vital part of my recovery as a parent of an addict and an enabler. I have not only become a stronger better person because of them but have made great friends and become a part of their family. This disease has such a stigma attached to it that we try hide our pain from our friends or family and feel like failures as parents. City of Angels gives us the tools we need and the support to heal. My twenty two year old daughter is a heroin addict currently incarcerated. The past three years have been a nightmare but thru it all City of Angels has been there for me and my daughter. They never give up even if treatment doesn’t work the first time, they are always ready to help get these kids out of dangerous situations and even support them by attending court dates or prison visits. My daughter and I always know we have angels looking over us which gives us the strength to persevere and I truly believe that because my daughter knows she has a great network supporting her she has a fighting chance of living a sober life. I have become a volunteer myself with COA because I want to be a part of this amazing team. They not only have interventions and find treatment for our children but they give them a vital support system for when they return home by giving them a safe place for meetings or just to hang out, counseling and a variety of sober events to teach them to have fun without drugs. All this is done at no cost and thru volunteers which makes it even more amazing. Spending time with these kids and my new family has given me hope and instilled a faith in me that I didn’t know was possible. 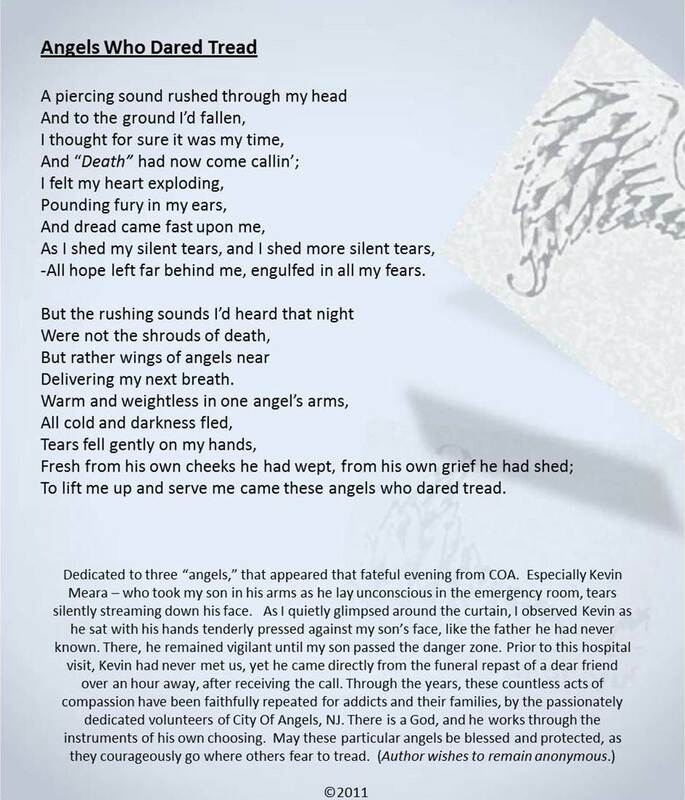 City of Angels is such an appropriate name for this organization because they truly are angels saving kids, helping parents and healing hearts. City of Angels was a very vital piece in my path to recovery. When I had hit my bottom and finally surrendered to my disease, they helped point me in the right direction of getting the help I needed. They were able to assist me in developing a treatment plan to put me on the road to recovery! I have now been sober five months. Thanks City of Angels! Before coming in contact with your organization six months ago my life was unmanageable and in constant turmoil. My 19 year old son in denial of his addictions and spiraling downward ever faster. I was at a point of desperation and it seemed that there was no help in sight and nowhere to turn. Trying to convince my son that there was a problem was virtually impossible and trying to find a facility to accept him or our insurance was a nightmare. I felt as if i were hitting a brick wall in every direction but by the grace of God I came in contact with The City of Angels. My son agreed to meet with Kevin and the outcome amazed me. Kevin reached out to him where I thought he couldn’t be reached. He was very responsive to the intervention and by the time Kevin was through speaking to him a facility was found and he was in treatment the next day. As for me I was encouraged to attend the family week at the facility where I learned the DISEASE OF ADDICTION and how not to be the enabling parent that I was. COA has made a positive impact in our lives in all aspects. I would like to take this time to thank the entire COA team for the help and support that they have given me and my son during and after our difficult times. Your tireless work effort and commitment for what you do compliments each and every one of you. You are all truly angels. It was as if the Lord finally listened to his voicemail, when the ‘Angels’ appeared in our lives. Our family was being destroyed by our younger son’s drug addiction (he is only 17 years old). Every day we wondered if it was going to be his last. The lying, stealing, deceit and everything else that goes with addition was just taking its toll on our family and those around us. Drug addiction doesn’t settle in only the poorest families or the wealthiest families……it can find it’s way into anyone’s family. We reached out in so many directions for help, but it wasn’t until the ‘Angels’ arrived that things started to fall into place. The ‘Angels’ (Joe, Valerie and Tammy) are the most knowledgeable, helpful, compassionate and organized people I have come across in a long time. They came into our home and helped us in so many ways. They helped remove that cinderblock that sat upon our chests. They took away the fear that we were living while we waited for placement for our son. They showed interest our son’s problem and did everything they possible could to help us prepare for his recovery. An addiction of some sort had touched their lives at some time which makes them so very educated on the subject. It was through their caring, understanding, knowledge and life experiences that our son is where he needs to be for hopefully the beginning of a drug free and successful future.